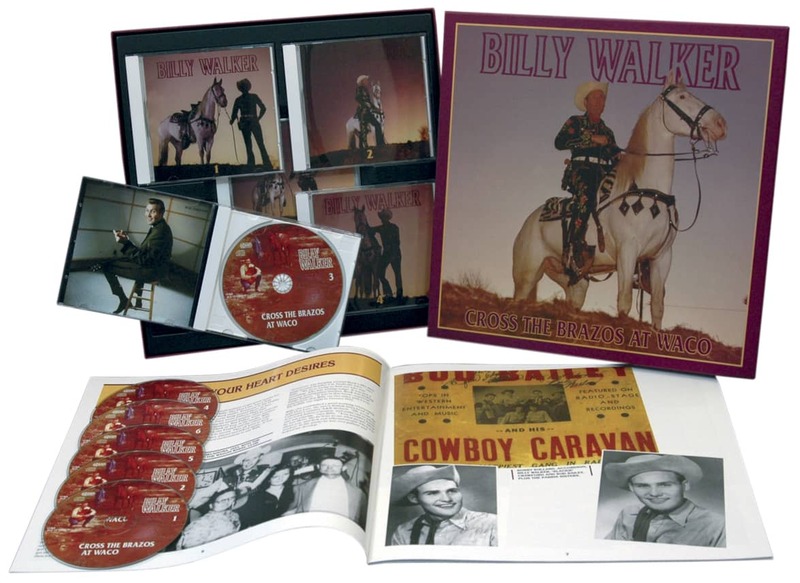 6-CD boxed set (LP-size) with 32-page book, 157 tracks. Playing time: approx. 403 mns. 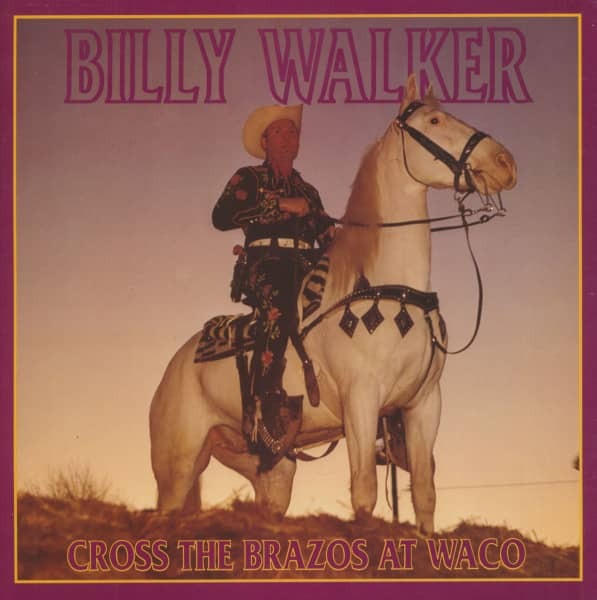 Bear Family is alone in documenting Billy Walker's career, starting with his first recordings for Capitol, and all the Columbia recordings, including the original version of Funny How Time Slips Away, and hits like Charlie's Shoes, Willie The Weeper, Cross The Brazos At Waco, and Thank You For Calling. Born in Ralls, Texas, on January 14, 1929, Billy was inspired by Gene Autry to take up music. After getting out of school in 1947, he worked various day jobs before beginning his career fronting for sometime Columbia artist Jimmy Lawson in 1948. He joined the Big D Jamboree in Dallas (where he was billed as the Traveling Texan and wore a Lone Ranger-styled mask) and worked for Hank Thompson in Waco. It was Thompson who got him his first contract with Capitol in 1949. Eighteen months later, Billy switched to Columbia. His first charted hit was Thank You For Calling in 1954. Billy joined the Louisiana Hayride in 1952, moved to the Ozark Jubilee in '54, flirted briefly with rock 'n' roll, and then returned to Texas to work the beer joints. In 1959, he moved to Nashville to join the Grand Ole Opry, and remained a member until his death. His records began charting with more regularity. His original version of Funny How Time Slips Away stalled at #23 on the country charts, but the follow-up, Charlie's Shoes, hit the top spot in 1962. He continued to chart records regularly into the 1980s, and his last records were on his own Tall Texan label. An engaging raconteur with a bottomless fund of stories, Billy was a much-loved character in Nashville. He was returning from a gig in Gulf Shores, Alabama when his van ran off the road and overturned. Those killed alongside him included his wife, Bettie, and a friend, Daniel Patton. -- We at Bear Family have reissued one of Billy's rock 'n' roll recordings in our "That'll Flat Git It" series, but we have also reissued all of his recordings complete from 1949-1965 on this complete 6-CD set. Books have been spun out of lesser fabric than Billy Walker's life. His mental log of all he saw and heard amounted to a journal of post-War country music. He was there at Hank Williams' last show and at Elvis Presley's first big public appearance in Memphis. He was hanging around waiting to cut a session while Buddy Holly recorded Words Of Love; he just narrowly missed boarding the plane on which Patsy Cline, Cowboy Copas and Hawkshaw Hawkins perished; and he was there the night that Red Foley passed away. Billy tried to draw some meaning from all this, but it was simply too numbing to contemplate. Now Billy himself has passed away. He was killed in a single-car traffic accident in the early hours of Sunday May 21, 2006 on a stretch of Interstate 65 in Alabama known as the Hank Williams Highway. Billy joined the Louisiana Hayride in 1952, moved to the Ozark Jubilee in '54, flirted briefly with rock 'n' roll, and then returned to Texas to work the beerjoints. In 1959, he moved to Nashville to join the Grand Ole Opry, and remained a member until his death. His records began charting with more regularity. His original version of Funny How Time Slips Away stalled at #23 on the country charts, but the follow-up, Charlie’s Shoes, hit the top spot in 1962. 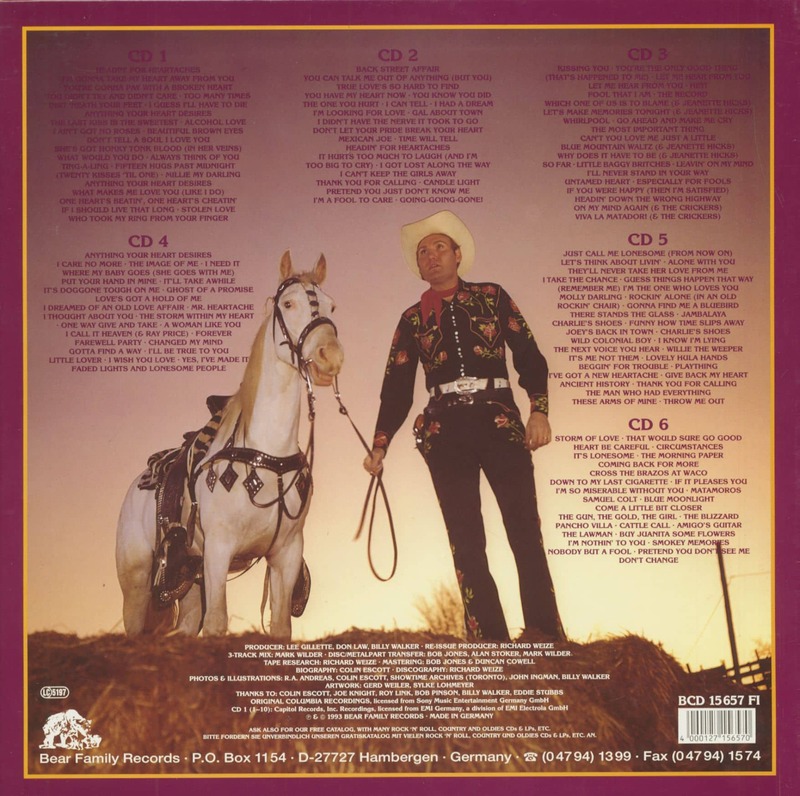 He continued to chart records regularly into the 1980s, and his last records were on his own Tall Texan label. An engaging raconteur with a bottomless fund of stories, Billy was a much-loved character in Nashville. He was returning from a gig in Gulf Shores, Alabama when his van ran off the road and overturned. Those killed alongside him included his wife, Bettie, and a friend, Daniel Patton. Customer evaluation for "Cross The Brazos At Waco (6-CD)"
Alles wie immer bei Bear Family super. Produkt hervorragend, ebenso der Service. Superschnelle Zusendung, Extra Dank auch dafür.